GREENWOOD VILLAGE, Colo., July 2, 2018 /PRNewswire/ -- Get ready for a summer of YUMMM® at Red Robin! Beginning today, Red Robin Gourmet Burgers and Brews is introducing its innovative, new Bottomless Hop-Salt Fries in restaurants nationwide. 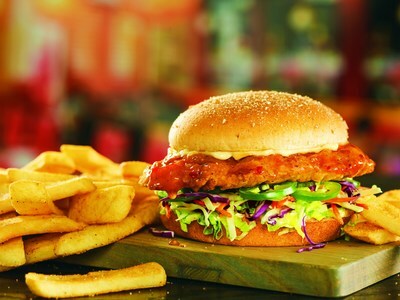 The Gourmet Burger Authority™ is also adding the fiery Island Heat Crispy Chicken sandwich – a gourmet crispy chicken breast tossed in Island Heat sauce with fresh jalapeños, lettuce, shredded cabbage, shredded carrots and mayo served on a whole-grain bun – to its menus for a limited-time through Oct. 14. Red Robin offered a sneak preview of its Hop-Salt Fries last fall at the 2017 Great American Beer Festival to showcase the brand's culinary creativity and tap into its beer and food culture in an innovative way. Hop-Salt Fries are an elevated version of Red Robin's famous Bottomless Steak Fries® topped with a new seasoning developed in conjunction with the Boston Beer Company to appeal to avid beer fanatics. The unique seasoning is made with the same Hallertau and Tettnang hops variety used to brew Samuel Adams® Boston Lager® and includes orange peel and brown sugar to balance the hoppy bitterness. "Our culinary team does a great job at finding just the right balance of high-quality ingredients that work together to bring out a truly unique flavor experience," said Dana Benfield, senior vice president and chief marketing officer at Red Robin. "Our innovative Hop-Salt Fries for beer lovers, as well as Island Heat Crispy Chicken sandwich, with its blend of tropical flavors, serve as excellent additions to Red Robin's versatile menu." Other new limited-time beverage and dessert options at Red Robin this summer include a signature Beer Flight with four-ounce pours of its exclusive Red Robin 1969 Lager™ brewed in collaboration with New Belgium Brewing Company, Boston Lager® and Lagunitas IPA®. Red Robin is also introducing sparkling Strawberry-Lemon Green Tea and Blackberry Hibiscus Herbal Tea as well as its take on a classic tres leches cake. The Dreamy Creamy Cake features a vanilla sponge cake decadently drenched in sweet cream and topped with guests' choice of rich caramel sauce or summer-sweet strawberries. In addition to its new menu items, Red Robin is offering a variety of deals and specials for guests throughout the summer. Every Wednesday, for a limited time, kids can eat for $1.99, which includes a choice of any kids' menu entrée along with a Bottomless beverage and side, when they dine-in at participating restaurants. Guests can also enjoy a $5 Mountain High Mudd Pie special on Red Robin's signature dessert and Burgers of the Month for a limited time. For more information about Red Robin's summer promo menu items or to find the nearest Red Robin restaurant, visit www.redrobin.com. To sign up for the Red Robin Royalty™ loyalty rewards program, visit www.redrobin.com/royalty.